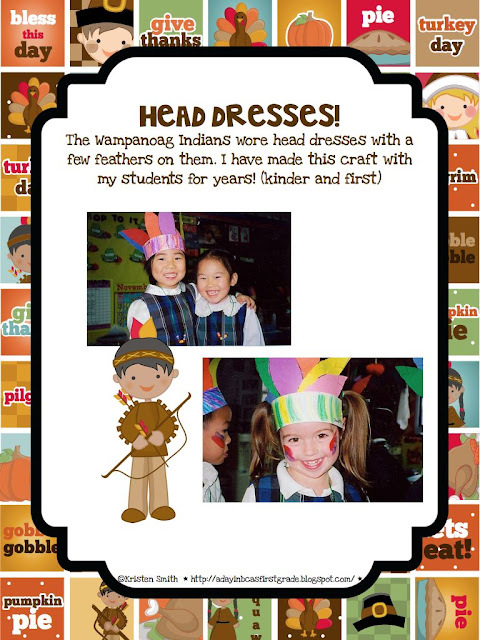 A Day in First Grade | Are you thinking about Thanksgiving?! Are you thinking about Thanksgiving?! I don’t know about you but even though Halloween is just around the corner, my mind has already gone to Thanksgiving! Thanksgiving is one of my ALL TIME favorite holidays. Maybe it’s the pumpkin pie. or the mashed potatoes? or the acorn squash? hehehe… I love it all. As you know (as I sit here wearing a RED SOX t-shirt) I grew up on the East Coast. I lived and breathed Thanksgiving facts and places while I was growing up. 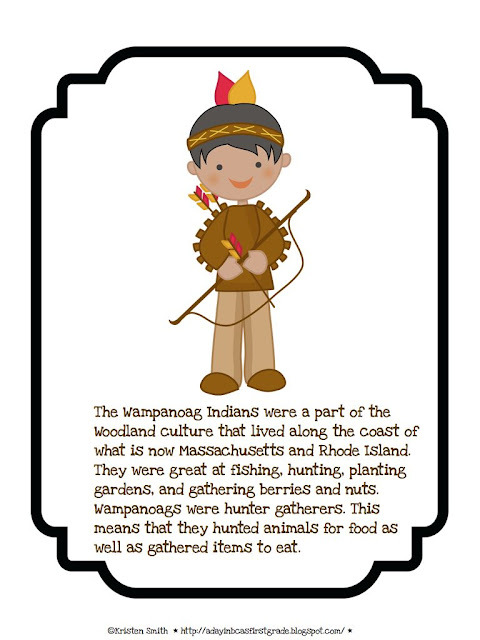 I frequented Plymouth Plantation, Plymouth Rock, and taught about the Wampanoags in the heart of where this Woodland culture was back in 1620. I have put together two packets that compiles facts, history and fun to help you as you get ready to teach about Thanksgiving. I also included crafts that you and your class could do. 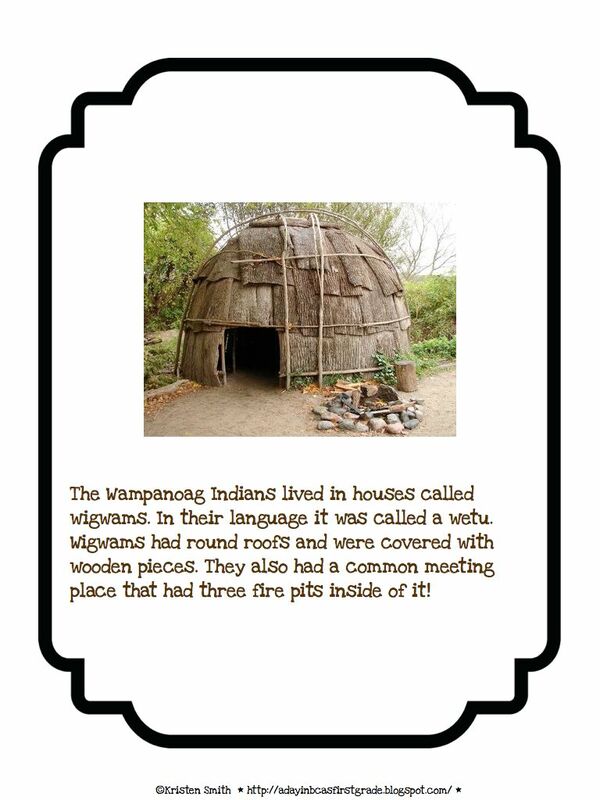 In the packet there are 12 pages of factual information that you could use in your class as a book, resource, bulletin board or as fluency reads. 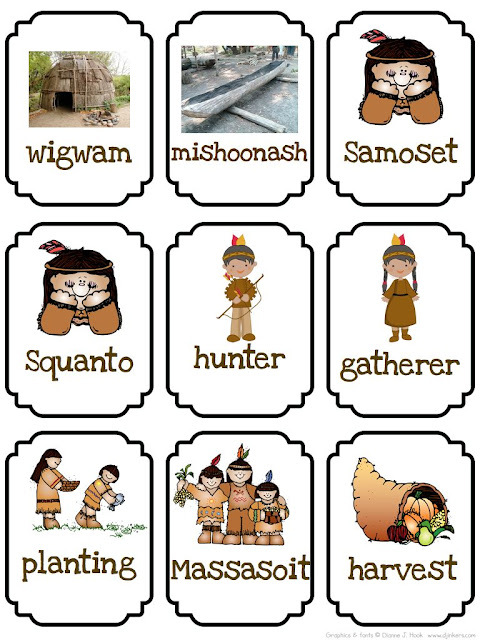 Also included are 18 vocabulary cards that your students can use when writing! There are also a few crafts in this pack! 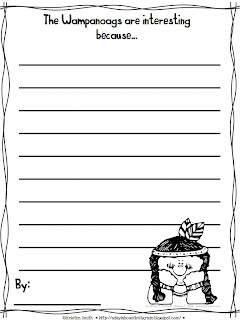 Not to mention there are 8 writing activities included! Here’s a FREEBIE just cuz’ I like ya! I’m going to give away ONE of these units to a random person who tells me what their favorite food to eat on Thanksgiving is! I’ll announce the winner on Sunday!! 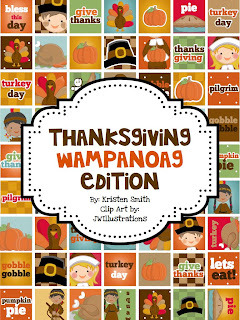 The product is available at my TpT shop for $4.00 along with a similar packet that focuses on the Pilgrims! Click on the cover to go to my store! Your packet looks really cute! My favorite food for Thanksgiving is stuffing. This packet looks great! I will check out the pilgrims packet too. My favorite Thanksgiving food is…sweet potato casserole. Love, love, love it! Great ideas in the packet! You always have great ideas. My favorite Thanksgiving food is the turkey with gravy!!! My family thinks I’m weird, but I LOVE the cranberries! YUMMY! I also love the leftover turkey sandwich for a late night snack. This packet looks great! My favorite Thanksgiving food is sweet potatoes! My first grade class goes to a farm to pick sweet potatoes, cotton, and corn to make popcorn. This looks great! My favorite food is a pumpkin pie dessert that is just like pumpkin pie with pecans….only easier to make! This looks thoughtfully planned! I am always looking for first grade friendly non-fiction thematic units of study. My family has a wonderful tradition of making Turkey Tamales with the left over turkey. Last year we added mashed potatoes and then dipped them in gravy. They were delicious! website, this web site is really amazing. plenty of useful facts, thanks for providing such statistics.